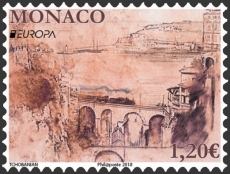 On 3 May 2018, Monaco issued a stamps as part of this year’s Europa series. The Europa theme this year is bridges. While the Sainte Dévote Bridge is prominent in the foreground, the Monte Carlo south jetee light (Jetee du Sud) can be seen in the background. This lighthouse, along with it’s sister on the north jetee were demolished in 2006 during a harbor expansion project. Click here to see more Monaco lighthouse stamps. This entry was posted in Lighthouses, Stamps and tagged Monaco. Bookmark the permalink.